Shown with flash. Colors appear darker in real life. Here’s my review and comparison of all four. Strongest hold: Anastasia Clear Brow Gel. It’s like applying a thin hair gel. It dries crispy like a hair gel, too. Most pigmented: Sonia Kashuk. 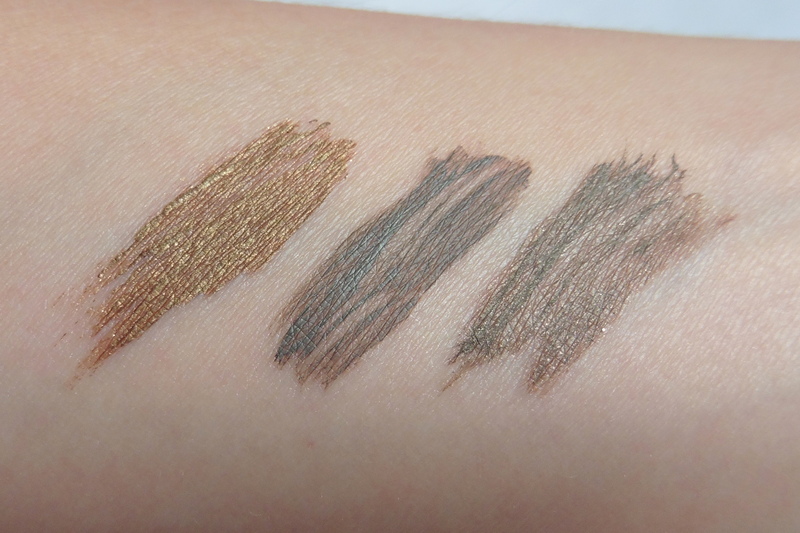 Although the three colored ones have similar pigmentation, the Sonia Kashuk has the thickest, heaviest texture and so more ends up on the brows. The elf has the driest texture and so it’s difficult to apply heavily enough to build up pigmentation. 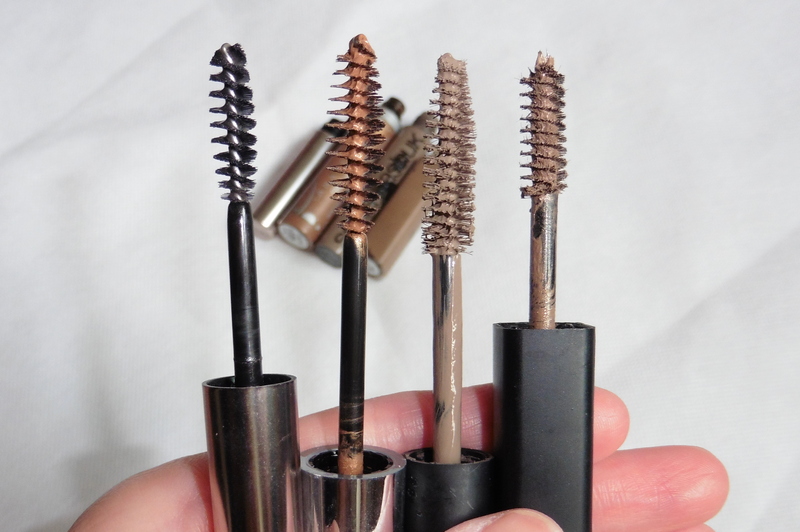 None of these are as pigmented as a true eyebrow mascara like the ones from Japan that make black eyebrows light brown. Most shimmery: Anastasia Tinted Brow Gel. I think the shimmer is intended to provide natural shine and depth to the brows. It doesn’t look shimmery or metallic on the brows though. The elf also has some shimmer, but it doesn’t translate to the brows; I only noticed it when taking photos for this post. Worst packaging: elf. I had to Superglue the packaging back together. Least used: Anastasia Clear Brow Gel. With sparse brows, I welcome the color boost of a tinted gel. I also don’t have unruly brows, so I don’t need strong hold. Then I switched to the Sonia Kashuk during my brief gray/cool-toned brow phase, inspired by the black brows sported by Cheon Song Yi in “My Love from Another Star.” (Black brows with warm brown hair were surprisingly flattering and natural on her.) 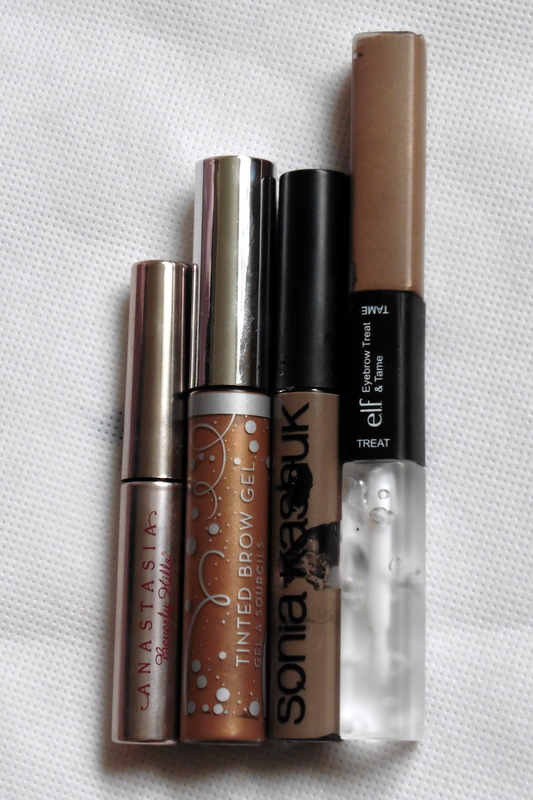 Now I switch between the Anastasia and Sonia Kashuk, depending on how warm/summery my makeup is.